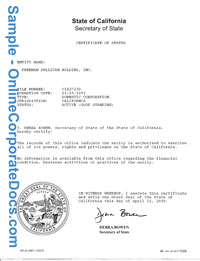 A Good Standing Certificate (Also referred to as the Corporate Certificate of Status or Corporate Certificate of Existence) is an official certificate from your Secretary of State that you are a legally incorporated or a foreign corporation registered entity and fully compliant with all state laws of incorporation to conduct business within that State. FOR MORE INFORMATION OR TO ORDER SIMPLY SELECT YOUR STATE BELOW! Online Corporate Docs, Inc. is a document retrieval service and is not engaged in rendering legal, accounting or other professional advise or services and limits its liability to the fees charged for its services. All information provided to Online Corporate Docs, Inc. will be held in the strictest confidence.